One of the great ironies of this story is how the Church that so hated the London commercial Stage contributed to its creation. Most of the commercial theaters created from 1576 on within the City and its suburbs were built in “liberties,” areas surrounding priories that early monarchs had taken under their wings to protect their favorite religious houses from being taxed by the City. By “Liberty” it meant that these neighborhoods were more or less free zones, free from the taxes, rules and constraints that governed the rest of the City. The London stage began in liberties because only in this way could the first commercial theaters, loathed by the clergy as dens of iniquity and by the city fathers as breeding grounds of plague and riot, be protected by their Privy Council patrons. Burbage’s Theatre in Norton Folgate, the two theaters in Blackfriars, the brief effort in Whitefriars, the Fortune in Clerkenwell, were all created on grounds formerly the properties of religious organizations like the Dominicans and Franciscans. What irony that it was the Church that supplied the newborn commercial stage with the locations, often even the buildings, where pagan merrymaking, anathema to everything the Reformed Church stood for, came laughing back to life. Perhaps the most important liberty that these former Church properties retained was the gift of sanctuary. Left over from the days when the Church was the only mediator in a society ruled by warlords, the protection this offered to people in trouble, jealously guarded by the churches within these liberties, was transferred by fiat to the Crown at the Dissolution of the Monasteries. In other words, most of the early commercial stages were built where their managers knew that their their actors and writers would be protected by the same laws that protected political and religious refugees, thieves and vagrants. Thus, when the City got anxious about riot or infection, it could not act unilaterally against them but was forced to negotiate with the Privy Council. Literary history tends either to ignore or sideline the theater patrons. Because most of the evidence that survives relates to the lives and behavior of the artisan-class theater owners, managers, and actors, historians tend to portray the men and women who lent them their names as largely irrelevant. The truth is that almost every move in the establishment of these theaters was the result of a careful game of political chess at the top levels of government and society. Since three of the most powerful Privy Councillors were patrons of the original acting companies while others were reformers who wished to see all but the most limited forms of public entertainment abolished, every move in the development of the London stage can be traced (if one cares to look) to the relationships between between theater builders and stage managers like James Burbage and Philip Henslowe with patrons like the Earls of Sussex and Oxford, Barons Hunsdon and Lord Admiral Charles Howard (later Earl of Nottingham). 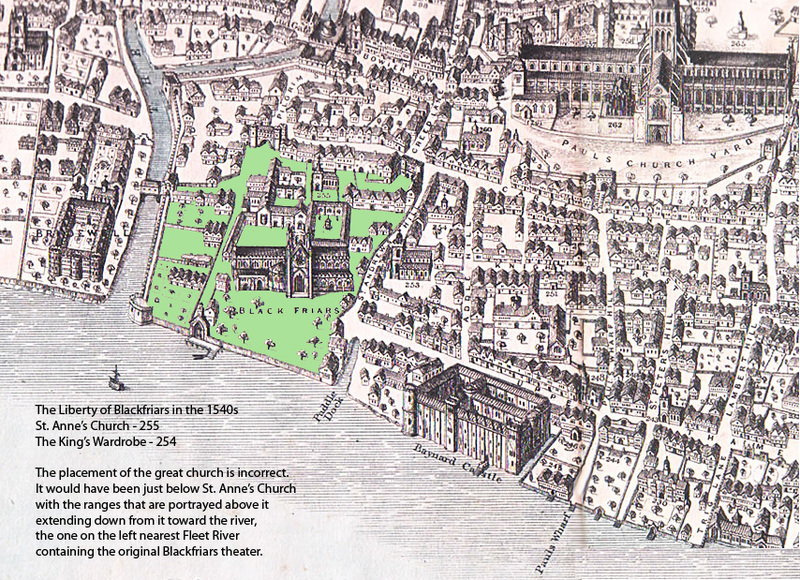 One of two year-round commercial theaters to open their doors in 1576, Blackfriars was located in the southwest corner of the medieval City where the old wall that enclosed it in a protective semi-circle met the Thames River [see map]. As its history proves, this location was chosen because of its proximity to the influential Westminster community known today as the West End, the neighborhood where the intelligensia of England provided playwrights and actors with their best educated and most sophisticated audience. Perhaps more to the point, it provided their patrons with England’s most politically influential audience. Today of course the West End is London’s major theater district, still cheek by jowl with its lawyers and law firms. The story of Blackfriars begins in 1278 when King Edward I had the western wall moved farther west to accommodate his favorite sect, the black-robed Dominican friars. Covering nine acres of prime real estate on the Thames, for centuries it was considered the most impressive religious establishment in England. The Black Friars were the confessors of Plantagenet kings from Edward I on down. Their confidants and ambassadors, many were learned; all were educated. Dominicans were forbidden worldly splendor, but such rules were ignored in London where, over time, through a steady stream of donations from wealthy patrons, the London Black Friars (they wore black robes over their white vestments) filled their riverside estate with elegant buildings adorned with stained glass windows, carved statues of the saints, marble tombs with gilded effigies of dukes and earls, and banks of glittering candles. Outdoors, spires towered over luxurious gardens that sloped down to the river, from which the monks had a broad view of the Thames all the way from Greenwich Palace on the far left bank to the far right where it embraced Lambeth Palace, home of the Archbishops of Canterbury. According to established Church tradition, mendicant friars like the Dominicans invariably built their churches on an east-west axis at the north end of a property, with the enclosed garden known as the cloister to its south and the churchyard with its preaching cross to its north. During the reigns of Edward I through Henry IV, a visitor entering the walled enclave from the City would pass through a gated entrance located at its northwest corner by Ludgate, or the one in the northeast corner hard by Paul’s Cathedral. An entrance at the south end admitted those travelling by water while a fourth located in the center of the east wall allowed traffic to pass to and from the King’s Wardrobe, where royal clothing and paraphenalia from many centuries was collected. A fifth gate in the western wall admitted tradesmen, lay visitors and guests who approached by boat from the Fleet River, a tributary of the Thames. Such guests would be housed within the sanctuary of the friary somewhere appropriate to their social status. Closed at dusk to keep safe all within, the gates were reopened every day at dawn. The Ludgate entrance led into the open space that, at Blackfriars, was both graveyard and assembly area for the crowds that in early times came to hear the scholarly friars preach from the central cross [graphic]. Walking further towards the river, as a visitor you would arrive at the main entrance to the Church at its western end, richly decorated with statues of the saints. To your right was a landing place on the Fleet River (still a real river) where tradesmen and other visitors could dock small boats. Here on the western side, with its access to the river, was the religious community’s primary connection with the outside world, while the eastern side remained private for the friars’ worship, sleep and study. Nestled in beside the church and projecting somewhat out from it at the church’s southwest corner was a two-story building––probably originally the sacristy on the top floor with a porter’s lodge on the first; this was the building later owned by the Brooke/Cobham family. Turning left past the porter’s lodge, you pass under an arched opening into the roofed-over walkway surrounding the Great Cloister, a square garden with perhaps a flowering tree or a pond with a fountain at the center, surrounded by a knot garden of roses, herbs, fruit trees and medicinal plants. In medieval times when the friary boasted upwards of ninety men, the top floor of the two-story eastern range to your left held the dormitory and library, while the top floor of the southern range in front of you and slightly downhill, held the warming house and school house, the stable beneath them on the ground floor. Replacing this or just south of it in Oxford’s time was the print house of Thomas Vautrollier, that in the 1580s and ’90s belonged to Richard Field. On the upper floor of the western range to your right was the long dining hall where the friars ate their bread and soup in silence as a reader at a podium read lessons from the Bible; in 1576, this would become (or abut) London’s first indoor commerical theater. Beneath it were kitchens and storage rooms; these would become the fencing academy of first Joyner, then Bonetti. With its north end located on Ludgate Hill, the land slanted down towards the river, a drop of 27 feet overall, so standing in the walkway with your back to the church, looking through one of the arched openings in the cloister, you would have had a broad view of the garden and, over the roof of the southern range, the winding river and the buildings on its far shore. Irwin Smith’s book Shakespeare’s Blackfriars Playhouse (1964), has clarified a number of things that previously were mostly guesswork. According to Smith, the original western range that abutted on the Great Cloister and that held the original dining hall of the friars, was extended at some point in time by another even longer and wider range that in early times may have reached the bank of the river. The lower floors of this range included a second dining hall and an infirmary, while the entire top floor was an immense hall known as the Parliament Chamber. 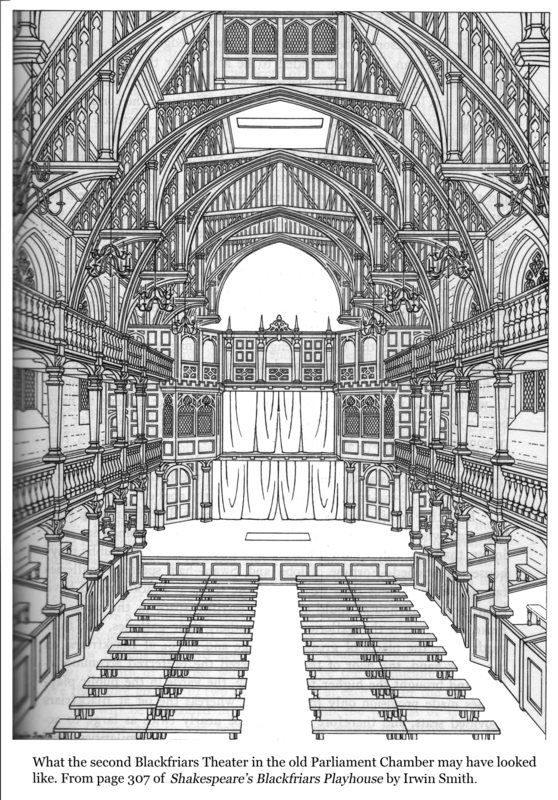 The fifth largest hall in England, Smith argues that this room, “created to house great assemblies,” never belonged to the friars, but was built by and for the Crown to house Parliament (98-100). He shows that the great chamber on the floor below was originally used as the meeting place for the Commons (22). Its location at the river’s edge (then a good deal further north than it is today) suggests that like so many of the great palaces of the time, it was there to make use of the river, for centuries the most common form of travel, while the housing needs of the MPs, come from all over England, were accommodated by the guest facilities of the great friary. In the early 16th century as the religious fervor that inspired the building of friaries in the middle ages began to fade, the rigorous practices of London’s Black Friars eased and their numbers decreased. This along with the increasingly cold climate may have had something to do with the fact that they began eating in a smaller dining room, one with a fireplace and no strict house rule against meat. Donations having fallen away, they began leasing parts of the friary (Smith 84). By 1522, the Frater, the original long dining hall in the western range, had been converted into a guest quarters which Henry VIII used to house Holy Roman Emperor Charles V and his retinue. Eager to please his prestigous guest, his wife’s uncle, Henry built an elaborately decorated bridge across the Fleet River that made it easy for Emperor and entourage to pass back and forth to Bridewell, the palace Henry built in his frolicsome youth. He may have chosen this spot because it was so handy to the Parliament Chamber and to the elegant accommodations he could offer his guests in the Blackfriars western range. By 1529 the scene had altered radically. The Parliament Chamber, where the brutal trials were held that took the crown from Katherine of Aragon and everything from Cardinal Wolsey, including his life, held bitter memories for the King. Having lost interest in the neighborhood of Blackfriars, he transferred everything up the river to Whitehall. The great Parliament chamber became his Revels office (99) a repository for the costumes, props, and pantomime wagons that had been his pleasure at Bridewell Palace. Under his son, Bridewell devolved into a disreputable holding tank for orphans and “disorderly women” that in later times became one of London’s foulest prisons. Following the dissolution of the monasteries, Henry gave almost the entire western half of the Liberty of Blackfriars to his Master of the Revels, Sir Thomas Cawarden (pron. Carden). Cawarden must have been a favorite of Henry’s, for following the King’s death, he acquired, by His Majesty’s order, most of the land and buildings in the western half of the liberty, several acres of prime central London real estate (116). Cawarden sought to justify the astonishing gift as repayment for what he himself had spent over the years in Henry’s service, presumably on entertainment. He expanded its use as a repository for revels paraphanalia, using some of it as a rehearsal space. With Henry’s withdrawal from this part of London, the loss of patronage from any other quarter, and the increasing use of the liberty for businesses and other mundane purposes, the once fabulous monastic buildings no longer got their needful repairs, outdoor statues developed crops of lichen while tenements and dives encroached on the neighborhood surrounding both the Liberty and St. Paul’s Cathedral nearby. Thus few complained when Cawarden tore down the once magnificent church and with its stone and other furnishings built new buildings, added to old ones, and sold or leased others as residences for courtiers. The huge Parliament Chamber he cut in half from front to back, leasing (in 1559) the westernmost of the two long narrow apartments thus created to Richard Frith, the Court dancemaster, while the eastern half went first to Sir John Cheke (died 1556), then in 1560, to Sir Henry Neville (father of the third Earl of Southampton’s Tower cellmate). The only buildings Cawarden couldn’t touch were those that the King had already given or sold to ranking courtiers like Burghley’s friend George Brooke Ld Cobham, Lord Warden of the Cinq Ports, who in 1558 passed along his Blackfriars property to his heir, William Brooke, whose daughter would marry Robert Cecil; Lord Zouche, whose son would be one of the eight wards raised by Lord Burghley; Sir Henry Wyatt, father of the poet who was executed in 1542 for his effort to overthrow Mary Tudor; and Sir William Parr, Queen Catherine Parr’s brother (114). Among these was also Christopher More, father of the Sir William More who would take a leading role in the story of the Blackfriars Theater when in 1560 he inherited the western range from Cawarden’s widow. Our interest in Blackfriars begins in 1562 when Oxford came to Cecil House. We know he studied dancing with Richard Frith, Court dancemaster since 1561, who came to Cecil House to teach Oxford dancing during his early days in London. It’s likely that by the time they were in their mid-teens, Oxford and Rutland, perhaps with other members of the Cecil House coterie––the Gentlemen Pensioners and students at Gray’s Inn who formed the core of Oxford and Rutland’s company at that time––would walk over to Frith’s studio at Blackfriars to rehearse for the masques that entertained the Court during the winter holidays. We also know that Oxford studied fencing. 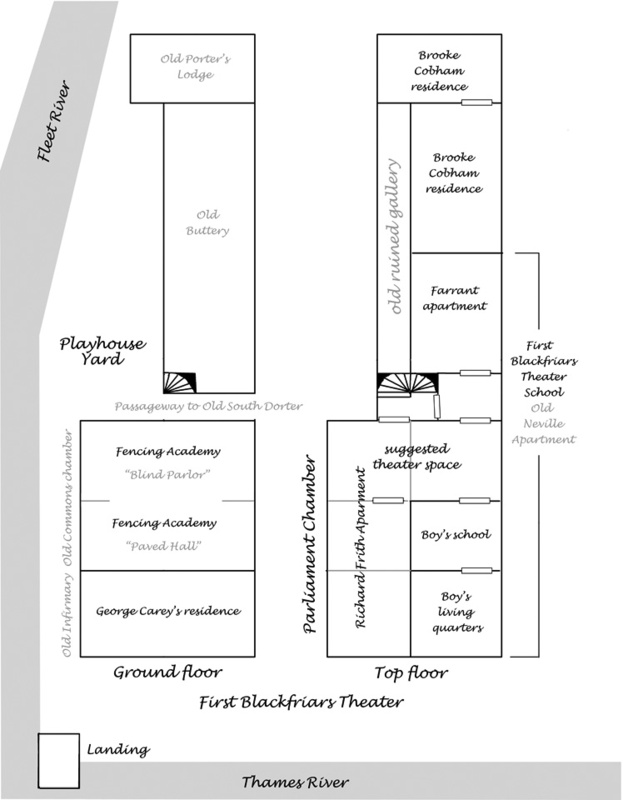 Early studies may have taken place at Cecil House, but beneath Frith’s dance studio at Blackfriars was the fencing academy of William Joyner (see schematic of the First Blackfriars Theater). It makes sense that, by age 15 or 16, once having learned the basics, Oxford would have gone to Joyner at Blackfriars where at any time he could find others at his skill level with whom he could practice. We know that in 1583, he acquired the lease to Joyner’s studio along with the lease to the theater/school apartment above it, and that, via his secretary, John Lyly, this was then passed along to fencer Rocco Bonneti the following year. By age 16 or 17 Oxford was involved in the production of entertainment for the Court’s winter holidays. With props and costumes still stored at Blackfriars and Frith’s studio still available for rehearsals, it’s fair to suggest that upon Oxford’s return from Italy, he and Sussex and Vice-Chamberlains Hunsdon and Howard, if desiring a venue as close as possible to the influential Westminster community, would be most likely to seek one somewhere in the western range at Blackfriars. Sir Henry Neville’s old apartment was available, and so with Neville’s and Leicester’s help, Farrant, Master of the choristers from Windsor, acquired the lease (127). The only “hard” evidence of Oxford’s involvement in the Blackfriars theater/school (so far) is his name on the lease in 1583. However, if we accept as evidence that the theater/school was created within a few months following his return from Italy; that the first play performed at Court by the Children following Oxford’s return and the theater/school’s creation, Mutius Scaevola, was on a subject dear to the heart of early Shakespeare; that plays known to have been performed at Blackfriars during those years later bore Lyly’s name, Lyly being Oxford’s secretary at the time; that the theater/school ran into trouble immediately following his banishment from Court (150); that by 1598 he was “known as best for comedy”; and that he had numerous other mentions over the years in connection with the Court stage, what evidence there is, taken in total, is certainly enough to bear the weight of conjecture that Oxford was far more important in this venture than merely a disinterested courtier who briefly lent his name to a troubled enterprise as a favor to his secretary. History tells us that the school with its popular little theater was officially closed in April of 1584 when landlord Sir William More finally won the lawsuit first instituted in 1581. Although there are clues that the school and the theater continued until the leases to patron Lord Hunsdon ran out in 1590/91 (156), there were no more complaints about the noise, or at least, none that have survived. In fact, it seems likely that the landlord’s motive for closing the school may have had less to do with the noise than would appear from his deposition. When the second theater at Blackfriars opened twelve years later in the gorgeously refurbished Parliament Chamber with a new company of boy actors, there were no complaints about the traffic and noise, at least, none that had any effect, for the theater soon became a London landmark which it remained until 1640 when the civil war closed all the theaters for twenty years. If it wasn’t the noise and confusion of the theater audience that offended the residents of Blackfriars, then what was it? Elizabeth’s fourth Parliament, first called for May 1572, was prorogued a month later and then again and again for almost a decade. This meant that Oxford and his patrons spent nine years––from 1572 to 1581––anticipating those times when the audience that meant the most to them were gathered for another session. The final session, January to March 1581, took place just prior to Oxford’s two year banishment from Court. If we’re correct in our view of Oxford and his patrons’ purposes in creating the theater school at Blackfriars, the session that took place from January to March 1581 would have been a peak moment for entertaining this community. Evidence of Oxford’s role in providing the Court with their winter holiday entertainments is seen in the fact that where the normal schedule included six or more plays, half by two or three adult companies, records for the winter of 1581-82, while Oxford was banished, show only three plays, all by the childrens’ companies, with none by any of the adult companies. The Court stage had recovered sufficiently by the following winter, with one play each by the companies under Sussex, Hunsdon and Leicester, but their titles show no connection to anything suggesting Oxford or early Shakespeare. I suggest that the real reason that certain residents of Blackfriars, influential members of Court society, wanted to see the theater school shut down was the nature of the plays that adult actors from Burbage’s company were performing there for the West End audience during the two-year period of Oxford’s banishment and the two years that followed. As I’ve discussed elsewhere, I believe that it was during this period that he wrote the versions of plays like Timon of Athens and Macbeth, whose themes and language would certainly have offended the Queen had they been produced at Court. Is it a coincidence that More got his ruling in April of 1584, at a moment when the Privy Council was aware that another Parliament was to be called for that November? As I show elsewhere, 1584 is the most likely date for the earliest versions of Julius Caesar, Coriolanus, Merchant of Venice, and most significantly, Hamlet. Claudius’s cry “Give me some light! Away!” followed by a sudden movement to produce lit torches would have far more dramatic impact in a darkened indoor theater than on a public stage in the middle of a summer afternoon. Historians invariably treat the “first” and “second” theaters at Blackfriars as separate entities, failing to examine closely why the companies that created them chose this particular location. One hasn’t to dig much deeper to see by the names of those involved that the history of performance at that site is almost continuous from 1576 to 1640. Why? Because of its location, so handy to the posh and influential West End, still today the great center of the London stage. And at the heart of the 18-year period when the stage at Blackfriars was not available to Shakespeare’s company lies the key to the mystery of his authorship.